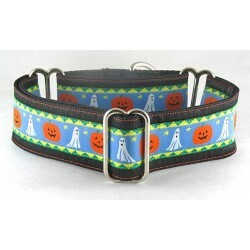 A collar for every holiday or occasion, including: Christmas, Valentine's Day, 4th of July, Halloween, St. Patrick's Day, Easter, etc. Available in martingale and side-release-buckle styles. Holiday Themes There are 59 products. Ghouls, ghosts, witches and more. Perfect for Halloween. Christmas collars sure to delight both you and your pooch. Perfect for stockings or under the tree. Available in martingale and buckle styles. 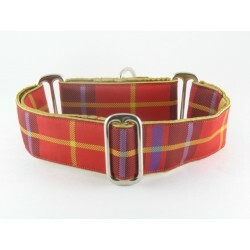 Valentine Delights: martingale collars and side-release buckle collars for sweetheart pups. Top of the mornin' to ye! Are ye wearin' the green? 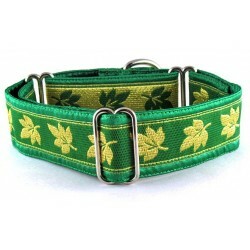 Well, ye can be with these spectacular collars designed specially for St. Paddy's Day! Patriotic, Stars and Stripes, and just plain red, white and blue, these collars are perfect to celebrate the 4th of July or wear all year long. 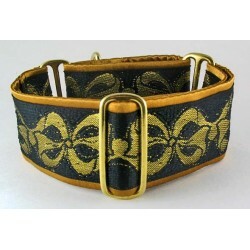 Big Golden Bows on Black martingale collar displaying sparkly, golden bows woven into a black background. Big Golden Bows on Ivory martingale collar displaying sparkly, golden bows woven into a ivory background. 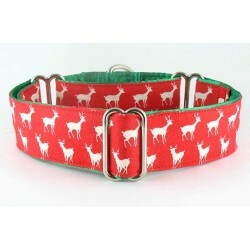 Blitzen martingale or snap-relase buckle dog collar - Festive reindeer sport around this red and white collar. 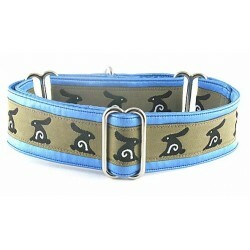 Bunny Boy Blue martingale or snap-buckle dog collar featuring a rabbit motif on a blue background. Bunny Girl Rose martingale or snap-buckle dog collar featuring a rabbit moftif on a pink background. 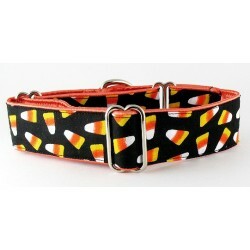 Candy Korn martingale or snap-relase buckle dog collar covered with Candy Corn treats. 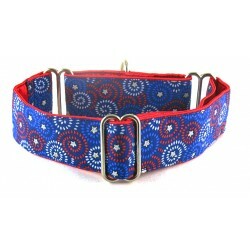 Centennial a martingale or snap-release buckle dog collar featuring a patriotic red white and blue starburst pattern. 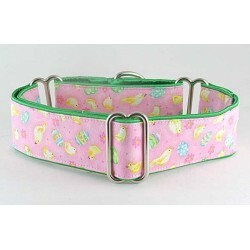 Chickadees martingale or snap-buckle dog collar decorated with an Easter theme including chicks and colorful eggs. 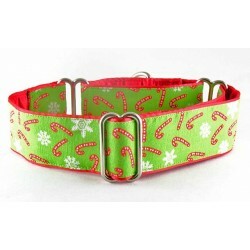 Cool Canes martingale or snap-buckle dog collar displaying a holiday candy cane theme, on a bright green background. 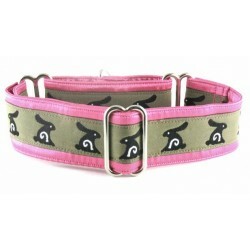 Cottontail Pink martingale or snap-buckle dog collar displaying a lively rabbit trim in shades of pink. 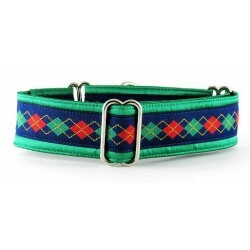 Coventry martingale or snap-buckle dog collar featuring a Renaissance design in bright blue, red, green and accents of metallic gold! 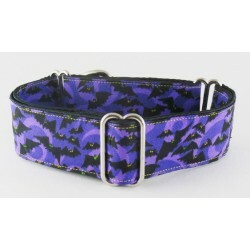 Draculets, black bats soar through a purple sky on this spooky Halloweeen collar. 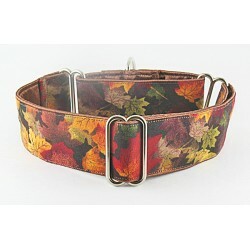 Earthy Leaves a martingale or snap-release buckle dog collar decorated with a medley of seasonal leaves of the fall. 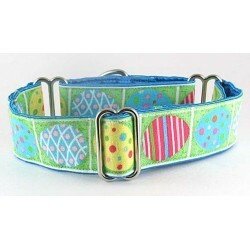 Easter Eggs martingale or snap-buckle dog collar decorated with multi-colored Easter Eggs. 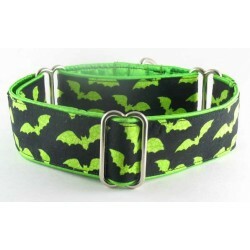 Electric Bats martingale or snap-buckle dog collar presenting bright green bats flying in the night sky! How SHOCKING!!!! 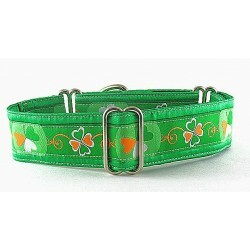 Erin, a fun Irish Inpired collar in shades of green and a dollop of orange. Your pooch never had it so good on St. Patrick's Day and beyond! 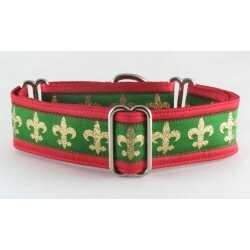 Festive Fleur Dis Lis martingale or snap-buckle dog collar embellished with a gold metallic Fleur Dis Lis backed on bright green. A cheerful red satin lining shouts holiday cheer! 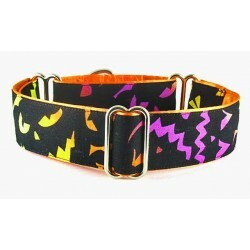 Frightful Faces martingale or snap-buckle dog collar decorated with bright yellow, purple and orange eyes! 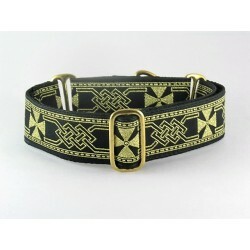 Gold Celtic Cross a martingale or snap-release buckle dog collar. The commanding Gold Celtic Cross runs parallel along this trim, and share space with a curvilinear, double link, diamond chain design on black.